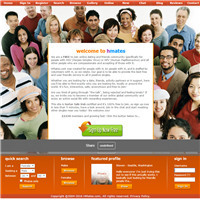 Hmates.com is one of the best online dating communities exclusively for people with HSV and HPV. It is worth noting that this site is absolutely free of charge despite being loaded with tones of features that can help users seek support and connect with like – minded people from all over the world. Given the fact that only HSV and HPV singles are on this site, your chances of finding a match would increase drastically. Hmates.com is one of the best dating sites for people with herpes and HPV that is absolutely free to use. The UI interface is easy to navigate and options such as quick search are available on the home page. The website came into existence in 2004 and doesn’t have a membership base as impressive as PositiveSingles.com. However, we did find a decent number of users that were online. It is also worth stating that the site is very practical in its approach and doesn’t make fake promises. Hmates.com is a free-to-join dating community designed exclusively for people affected with HSV and HPV. The friendly and supportive community aims to connect like minded people so that they can make friends, seek support and also a life companion. The website allows users to create a lifetime profile, complete with pictures and videos, in addition to other personal information. Registered users of this site would also be able to access chat rooms to interact with other people in a more open environment. On the other hand, if you’re looking for a more private space to interact with others, using the instant messaging feature would be of great help. The website also boasts of an excellent auto-matchmaking service that shows prospective matches that you might be interested in. The website also offers special benefits to those making any donations. The STD directory on this site would give you tones of information pertaining to herpes as well as HPV, thereby helping users manage their condition effectively. As mentioned earlier, Hmates.com is absolutely free to use for all. Nonetheless, the site accepts donations and gives special privileges to those who donate. Given the fact that Hmates.com is absolutely free to use, it offers way more than what its competitors do. Without having to pay a cent, the site allows users to make a comprehensive profile, share pictures and videos, access chat rooms, make use of the built – in instant messaging client and find a compatible partner using the auto – matchmaking algorithm available on the site. While the membership base of 21,702 might not seem impressive, especially when we have websites like PositiveSingles.com in the same list; it is still a decent number. All in all, Hmates.com isn’t a bad dating site if you’re affected with herpes or HPV. With membership costing absolutely nothing, you’d be able to connect with like – minded people and seek the kind of support you had always desired.